1. Proprietors dissolved their partnership and H. G. Blake took over the business in 1847. 1. H. G. Blake has associated with him in business Mr.Colborn under the name of Colborn and Blake, where they will sell goods at prices to suit the hard times and will buy butter, eggs, hides and wood. 2. In 1877, Warner and Shepard split. Warner stays in the Phoenix block and Shepard goes to the Empire Block. 1. Mr. Warner’s two sons Willis L. and Carl E. Warner are employed as clerks. 2. "C. J. Warner has purchased the McClure block on the west, side of the square, now occupied by Yoder Bros., as a shoe store. C. J. Warner and Son will move their dry goods store into this building, and it is rumored that a new dry goods store is to be started in the room vacated by them in the Phoenix block." 3. In 1881, a new exterior stairway on the west side of the Phoenix block was required by an Ohio State Safety Officer. A Rope-walker traversed from the Gazette Building roof on South Court to a window in the Phoenix Block in 1882. 1. Phoenix Dry Goods Store in 1894. The Members of the clerking staff shown here are, R/L The late Dr. Harrie Hard, the late Mary Canavan, sister of Ella Canavan, W. E. Hemmeter, proprietor who operates his store on West Liberty Street, with son Lawrence, and Mary Welton and Hattie Elder, dressmaker for the store. 1. E. C. Ziegler moved his family to Medina in 1904, to take over the dry goods store in the Phoenix Block. 1. There was extensive repairs and remodeling to the Phoenix Hall. 1st power passenger elevator from basement to 3rd floor with electric push buttons has extend Zeigler dry goods store to 3rd floor now occupying all of what had been the Phoenix Hall, making it the largest store room in Medina and well-lit with many windows in 1915. 2. E. C. Ziegler retired in 1927. 1. Harold Y. Ziegler moved his dry goods store from #36 south-side Public Square to #23 Union Block on the west-side of Public Square formerly occupied by Gensemer Millinery and Yards Goods Store since 1915. A huge airway beacon revolving 2 times per minute with 8 million candle powers can be seen 10 miles mounted on top of the Old Phoenix Bank in 1928. This store at #35 Phoenix Block was occupied as a Dry Goods and Grocery Store for 91 consecutive years. 1. Harry H. Bachtell moved his drug store one door to the west in the Phoenix Block to #35 South-side Public Square formerly the Ziegler Dry Goods Store since 1904. 2. Harry H. Bachtell will expand the back of his store into Ziegler’s Display Store in 1940. 2. Bachtell closed the soda lunch room and put in a poultry and animal Department in 1943. 3. Harry H. Bachtell died 1967, Store closed in 1968. This Phoenix Block has served as a home for banking operations for 170 years. 1. In 1854, Dr. C. N. Lyman opened an office here and also went into the drug and book business, formerly owned by U. K. Curtiss under the name of Lyman Armstrong. 1. Founded in 1859 the store was located in a building where Old Phoenix Bank is now. 2. Griesinger started with a shoemaker’s bench, a side of sole leather and a kip skin. 1. The new firm of McDowell and McDowell offers everything to be found in a drug store. 1. The second fire on the Medina Square in 1870 destroyed the bank, but not the safe within it. After this calamity, Blake rallied the citizens of Medina to begin rebuilding the structures damaged or destroyed by the fire. He put forth his bank as the first business to lead this movement, hence the name the Old Phoenix Bank, deriving from the mythical phoenix known for rising from the ashes. From this pivotal moment in Medina history the bank continued to grow and open other branches. 2. The largest stone yet dug from Weymouth Quarry to be used for the foundation for the safe at the Old Phoenix Bank was 6 x 11 feet and 14” thick, thought to weigh 5 tons was too heavy for the Cook Road bridge and had to be cut in two slabs. 3. 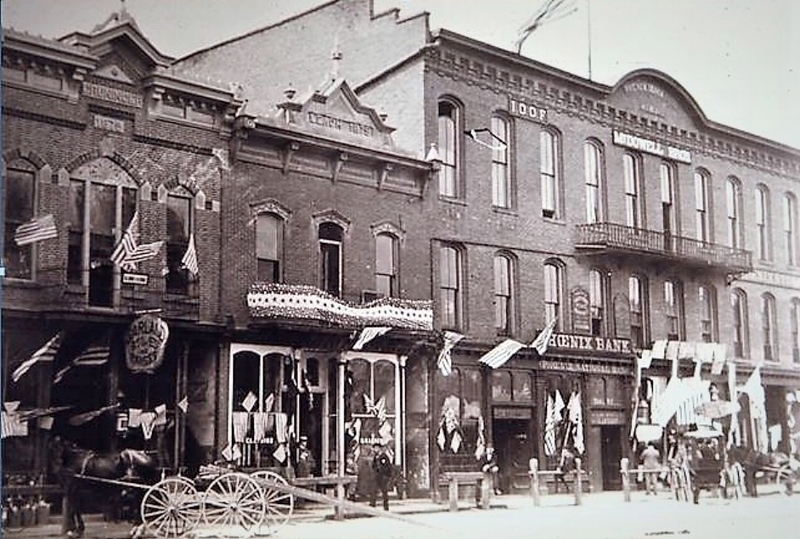 An old building stood where Sturgis livery is in 1885 and H. G. Blake moved his goods there after the fire, then in the summer of 1870 built the Phoenix Block with 250,000 bricks furnished by William Foot at $2.75 per 1000. A Berea flag walk was added in front of the Phoenix Block in 1871. 4. 1870-1871-Construction of Phoenix Block was brick and iron with plate glass windows by McMullen and Company of Akron. Bowman Brothers will make 635,785 bricks. Ornamental title page on the face of the Phoenix Block was dressed in gilt. Arched elaboration with an inscription at the top “1870”. The west wall of Phoenix Block put up by McMullen Brothers was about the finest specimen of brick work in 1870. Iron front, cornices and columns built by House of Silas Merchant in Cleveland. E. E. Clapp of Cuyahoga County is superintendent of the building, for a cost of $500. 1. A. I. Root Vegetable and Seed business sold to E.C. Green and Son. Seeds sold at Wright’s bookstore in 1904. E.C. Green sold trees for Granger Nursery in 1880. 1. In 1919, a new drug store (the 3rd) in Phoenix Block, was McDowell Drug Store for 75 years. George S. Simmerman had been with W .J. Wall Drug Store and Harry Bachtell had been with J. Tuttle Drug Store. 2. Simmerman and Bachtell put on the road a machine advertising their Rexall remedies which will make regular trips over the county, a new departure in 1927. 3. Of course you know the identity of the one drug store in Medina which has two names. One of its names comes to it because of a certain line of remedies and sundries they carry and for which they have the exclusive sale in Medina. These remedies and sundries are put on the market by large manufacturing concern representing more than 12,000 stores in the United States and foreign countries. Messrs. G. S. Simmerman and Harry Bachtell are the friendly proprietors who have a financial interest in the parent house of Rexall. Rexall is a Latin word meaning "King of All." In every town of any size one finds The Rexall Drug an outstanding store in the community, and the shelves are always stocked with the best possible merchandise. 4. Our Rexall store here is to be complimented upon its prescription department where a pharmacist is always, at any time of the day, in charge. The careful compounding of a prescription is quite as important as the choice of a doctor when you or one of your loved ones is ill. The best efforts of your physician will come to naught if what he prescribes is not followed out to the last item. A place where we do not gamble and| where we may rest assured of accuracy is Simmerman & Bachtell Rexall store at Medina where the words "service" and "efficiency* means something. 5. Simmerman and Bachtell represent Hess and Clark of Ashland who are so well known to our Medina county farmers for their stock tonics. Twice a year Simmerman and Bachtell would call on the local farm trade with the Hess and Clark detail man. Both men seem to strive, from every angle, to give their best of their knowledge to the community. The partnership of Simmerman and Bachtell had its inception in 1919. 1. Co-owner, George Simmerman died in 1938. 2. In 1940, Harry H. Bachtell moved his drug store one door to the west in the Phoenix Block to #35 South-side Public Square formerly the Ziegler Department Store since 1904. 1. Gensemer Store hours are 8:15-5:30, Sat 9-9 in 1940. 2. O. .E. Meyers sold the building at 110 West Washington Street to M. M. Gensemer and he built a concrete office to the rear, installed a new store front and remodeled the 1400 square foot sales room in 1951, but Gensemer did not move his store, because he died during the renovation of the store. 3. Gensemer Yard Goods Store was sold to Rittman Department Store and proprietors Clyde Ambrose and Homer Moore will sell the stock in 1951. 1. Daughter and son-in-law, Harry Wilson were Agents. 2. Rickard moved Agency to 116 West Washington Street in 1963. 1. Phoenix Block remodeled with polished granite front, central door and large electrified sign in 1952. 2. New marble front and canopy added to Old Phoenix Bank and Bachtell Drug Store fronts and Electric lines were laid under the walks to melt snow in 1963. 1. 1876 - "Medina has suffered an irreparable loss in the death of an old and influential citizen. Honorable. H.G. Blake. He was taken sick April 8, with congestion of the lungs which ran into pneumonia and continued to grow worse from day to day till April 16 when he died. The funeral was held on Wednesday. All places of business were closed during the time and the public buildings and business fronts were draped in mourning and on the balcony was displayed the motto, “People's Friend." 1. His pictures are guaranteed not to fade. 1. Morning Star Lodge No. 26 meets every Monday evening at their Hall on the 3rd Floor. 2. Officers elected Monday evening, December 31, 1877 were Joseph Andrew, N. H. Bostwick, W. W. Munger, G. W. Hobart, R. W. Clark; Trustees were A. Sanders, T. S. Shaw and W. W. Munger. 1. Artificial teeth inserted in the most approved style and all dental operations in the best and most durable manner. Especial attention paid to the preservation of natural teeth. 1. At the time of the fire, A. Andrews who slept over Blake and Woodward’s office in Phoenix Block left a watch in his bedroom. The other day, this watch was found in the ruins in the cellar. The case was gone, but the enamel dial was there. Although melted, the hands were still sticking to it. It has stopped 23 minutes to 3 o'clock. A. Washburn on this village made the watch in 1856. He has put in a new main spring and it is now keeping good time. 2. Another watch has been dug out of the ruins at Phoenix block. It is a lady's gold watch belonging to Mrs. G A. L. Boult and was carried by Ben. The night of the fire he left it in his vest pocket on his bed in the second story, it went down with the inwards of the building and is in good shape to be preserved as a relic, but of not much use as a watch since it stopped at 3 o'clock." 1. R. O. McDowell 80-yr-old Insurance Company sold to Stanley B. Rickard in 1946. Agency was in the Phoenix block for 50 years. 1. Library is over their drug store. Any book 10 cents per week in 1872. 2. Willie Dean sells ice cream in Phoenix Block above the McDowell Drug Store every Saturday evening in 1872. 1. Cook and Kroger fresco artists and scenic painters from Cleveland painting 8-10 sets of scenery for Phoenix Hall in 1874. The drop curtain for the Phoenix Hall stage painted in Cleveland with a scene of “Washington Crossing the Delaware” by Archibald Willard for $100 in 1871. 2. The walls painted and kalsomined with a handsome border and two splendid chandeliers with 12 lights each in the Hall in 1878. 1. The O. H. McDowell Store purchased a good supply of roller skates in 1881 and opened a rink and rented skates for one dime. 1. March 26, 1885, Abbey’s Uncle Tom’s Cabin will appear tomorrow night in Phoenix Hall with a brass band, plus Siberian bloodhounds, donkeys and jubilee singers will be on the program. 2. Andrew was a Medina County Prosecuting Attorney. 1. A room in McDowell Block vacated by Post Office has been fitted up for the Ohio Gas and Electric Company with C.M. England, manager and Miss Gladys Hyde and Mrs. Margaret Forks employees in 1916. 1. Neumeyer is located in McDowell’s Insurance office on 2nd floor over the Phoenix Bank. 1. Ainsworth leased rooms in Phoenix Block vacated by Frank W. Woods law office. 1. Y. M. C. A. was formed in Medina in 1907. 1. A. L. Caylor, Harry Wilson and Roy Kruggel, Salesman. 1. Hunter moved to 702 N Court Street in 1967. In 1873, after the village fire and the rebuilding of the Phoenix Block, the now chartered Phoenix National Bank moved the offices to #38 East Washington Street still in the Phoenix Block. In 1963, the #36 first floor of the Phoenix Block is now expanded for the lobby and offices of the Old Phoenix National Bank. In 1968, the entire first floor of the Phoenix Block is now expanded for the lobby and offices of the Old Phoenix National Bank. For continuity Beyond the Storefronts will have the history of the Old Phoenix National Bank and its successors listed on this location from 1848 to present. 1. An orphan, Harrison Grey Blake -- better known as H. G. Blake around the Medina community -- founded the old Phoenix Bank in Medina, Ohio in 1857 as a private banking institution. 2. Blake initially bought a general store and added an iron cage, or safe, to the back room, thus creating a bank. 1. In 1873, Mr. Blake converted the bank into a regular stock organization charted as a National bank under the United States banking laws, under the name of the Phoenix National Bank. 2. The histories of the great financial institutions of the world, if written separately, were a large part of the earthly record, and so of a nation, a city or a village. Without sound financial institutions we should he like a ship without a rudder or a compass, wandering aimlessly about upon the great sea of business, the victim of the winds of bankruptcy and the waves of financial ruin. 3. The Phoenix National Bank had its origin in the minds of some of the best and ablest business men in this section of the state. Men whom a wide range of business relations had fitted to manage successfully the institution they sought to establish. With such men as these to manage the affairs, its success was assured from the start. 4. The charter which was issued by the United States on February 10, 1873 authorized a capital stock of S50, 000.00 which was increased to $75,000.00 a few years later. 5. The officers chosen were J. H. Albro, president, H. G. Blake, cashier. The boards of directors were J. H. Albro, H. G. Blake, John Rounds, S. G. Barnard, B. H. Wood, N. T. Burnham, R. M. McDowell, A. H. Hawley and C. J. Warner. 6. The 1st installment of currency for the Phoenix National Bank is in circulation May 2, 1873. 7. Blake added a platform just outside the pavement on the north side of his block to make it easier to hitch horses in 1874. 8. In 1876, "Medina has suffered an irreparable loss in the death of an old and influential citizen Honorable H.G. Blake. He was taken sick April 8, with congestion of the lungs which ran into pneumonia and continued to grow worse from day to day till April 16 when he died The funeral was held Wednesday. All places of business were closed during the time, and the public buildings and business fronts were draped in mourning, and on the balcony was displayed the motto, “People's Friend." 9. The attendance at the funeral was large amounting to thousands, and was conducted without display or ostentation, the demonstration throughout; being a spontaneous tribute of respect to the memory of the friend and neighbor who has passed away. 10. Rev. A.T. Reed, pastor of the Congregational, Church, preached a brief and impressive sermon. At the request of the friends addresses were also made by J.H. Qreene, Rev. B. J. Hoadley and Governor Edgerton of Akron. The pall bearers were: S. B. Woodward, G. W. Lewis, W. G. Tilley, W. T. Burnham, C. J. Warner, Vim. R. Alden, G. A. L. Boult and S. G. Barnard. S. H. Bradley superintended." 1. James H. Albro, long one of the most conspicuous business men in Medina was born in Cummington, Mass in 1820 and in 1836 the Albro family moved to Medina. 2. For many years James H. Albro engaged in the mercantile business with his father and grandfather under the name of J. Albro and Company. 4. After an honorable career of 20 years, during which the business and importance of the Bank steadily increased, the charter expired by limitation and in taking out a new charter the name was changed to the Old Phoenix National Bank. 5. In 1873, R. M. McDowell was chosen assistant cashier of the Phoenix National Bank and three years later he was made cashier. 1. At the reorganization of the bank in 1893, Robert M. Mc Dowell was elected President of the bank and under his guidance it was made on of the strongest banking institutions in this part of the State. 2. R. M. McDowell was one of the directors of the Ohio Farmers Insurance Company and served as chairman of the Finance Committee. 3. This charter, which on the U. S. Treasury Department records was No. 209f, expired in 1895. Not wishing a new charter for the old organization, a change was made in the name and a new charter which is recorded as No. 4842 was issued to The Old Phoenix National Bank. This charter, issued in 1893, will expire in 1913. 4. In the new organization nearly the same men are at the helm as in the old. They are all men of sterling integrity and good financial ability, and under this management the bank continues to flourish the same as under the former management. Under the present charter the officers and directors are as shown above. 5. The capital stock is $75,000.00 and there is a surplus fund of $6,000.00, undivided profits of over $5,500.00, and deposits of over $5,000.00. This last named item shows the confidence the public has in the soundness and stability of this institution. 6. Four per cent interest is paid on all deposits in the savings department. The public is always sure of considerate and courteous treatment when doing business with this, the oldest, the strongest and soundest financial institution in Medina county. 1. In January, 1898, the annual election of officers and directors was held and Joseph Andrew succeeded Baxter H. Wood as President, Okey H. McDowell was elected Vice President and B. Hendricks remained Cashier. 1. Blake McDowell was born in Medina, October 31, 1868 and completed his education at Oberlin College after which he returned to Medina and began his career with the Ohio Farmers Insurance Company by taking over from his father, R. M. McDowell, the agency for Medina County. 2. In 1896, Blake McDowell was made assistant cashier of the Old Phoenix National Bank, of which his father, Robert M. McDowell, had long been cashier, and his grandfather, Harrison G. Blake was the founder. 3. In 1897, Mr. McDowell became cashier of the bank upon the death of his father, R. M. McDowell. 4. Ill health, resulting from a very severe illness, compelled Blake McDowell in 1908 to seek a milder climate and outdoor life. Accordingly, he went to Texas and engaged on a large scale in the cattle business, where he and his family enjoyed five years of frontier life. 5. Blake McDowell and his family returned to Medina in 1913 and he resumed his position as cashier of the Old Phoenix National Bank, so ably managed by B. Hendrickson during his absence. 6. In 1916, Blake McDowell succeeded Joseph Andrew as President of the Old Phoenix National Bank. 7 The Old Phoenix National Bank of Medina in Ohio printed $1,340,810 dollars’ worth of national currency. Over $1,000,000 face value is a lot of money. However, some types and denominations of currency from this bank could still be rare. 8. That printing period is a fairly normal life span for a national bank during its life, The Old Phoenix National Bank of Medina issued 13 different types and denominations of national currency. 9. The Old Phoenix National Bank of Medina was located in Medina County. It was assigned charter number 4842. 10. The Old Phoenix National Bank of Medina also printed 232 sheets of Type1 1929 $20 national bank notes. That may sound like a very small number, and it is. However, when it comes to small size notes, that print range usually allows for a handful of survivors. Andrew Jackson is featured on the front of each 1929 $20 bill. 11. 1931-The staff of the Old Phoenix National Bank is preparing for possibilities — revolver target practice in a range erected in the basement of the bank has become a regular thing with the men of the staff. 1. Clyde E. Jones was born in Westfield Township, the son of Mr. and Mrs. Merritt E. Jones and during his youth acted as teacher in a one-room country school for about two years. 2. Mr. Jones has been connected with the banking business in Medina for over 50 years. He started his career with the Savings Deposit Bank and after two years with that institution, he joined the staff of the Old Phoenix Bank where he served in various capacities for 49 years. 3.. Clyde E. Jones, cashier of the bank for the past 31 years was elevated to the position of President, made necessary by the recent death of Blake McDowell. 4. This reorganization in 1931 placed the following to positions on the Board of Directors; H. G. Rowe, Chairman; John A. Weber; D. C. Shepard; F. H. Hawley; Elbridge F. Gibbs; Clyde E. Jones; Paul M. Jones; J. T. Calvert; and W. A. Calvert..
5. Mr. Jones has been a director of the Ohio Farmers Insurance Company of Leroy for the past 14 years and in 1938 was elected treasurer of the company. He was also treasurer of the Ohio Farmers Indemnity Company. 6. Mr. Jones was exceedingly active in civic and banking affairs. He served for several terms on the Medina village council and. as a member of the Board of Education, and at various times was a member of a number of committees of the Ohio Bankers Association. 7. Fraternally he was affiliated with Medina Lodge 58, K. & A. M. of which he was a past master, Medina Chapter No. 30. Royal Arch Masons, and Comet Temple Knights of Pythias. He was a member of the Kiwanis club, Medina Chamber of Commerce. 8. Mr. Jones was a lover of fine horse flesh and took a keen Interest in the Medina County Fair. 9. This national bank opened in 1893 and stopped printing money in 1935, which equals a 43 year printing period. 10. That printing period is a fairly normal life span for a national bank during its life. The Old Phoenix National Bank of Medina issued 13 different types and denominations of national currency. 11. Elbridge Gibbs, cashier of the Old Phoenix national Bank, was a victim of a pickpocket Tuesday night at the county fair, the amount taken being about $20. This was the only case of the kind reported. 1. Elbridge F. Gibbs was born in Brunswick, Ohio on March 11, 1889 and attended Brunswick Schools before coming to the county seat to work for the Medina County Treasurer’s Office. 1a. Elbridge F. Gibbs this week in 1911 resigned as deputy to County Treasurer Aylard to accept a position at the Old Phoenix National Bank. 2. Taking a post with the Old Phoenix Bank, Mr. Gibbs worked in every capacity reaching the position of President in 1945 before the time of his retirement in 1955. 3. Long interested in the Medina Community Hospital, Gibbs served as Chairman of the Board beginning in 1966. 4. Prior to the City’s assumption of the cemetery operations, Gibbs served as Treasurer of Spring Grove Cemetery for many years. 5. Mr. Gibbs was a long-time member of the Medina County Fair Board and had an abiding interest in harness racing. 6. Mr. Gibbs was very active in many civic, fraternal and church organizations including Masons, Knights of Pythias, Shriners, Kiwanis Club, YMCA, Community Chest and First Christian Church of Medina. 7. Elbridge F. Gibbs, after retirement, wintered in Florida for many years and passed away in June, 1966 at the age of 77 years. 8. In 1952, Phoenix Block remodeled with polished granite front, central door and large electrified sign. 1. Having begun his professional career as a bookkeeper at the Old Phoenix National Bank, Paul Jones served as president and chairman of the board of the bank for 49 years and of the Ohio Bankers Association, and as head of the National Bank Division of the American Bankers Association. 2. His leadership at Old Phoenix and his foresight as a trustee of the Letha House Foundation resulted in his affecting Medina County in significant and enduring ways. He helped make possible the restoration of Medina's Public Square, construction of its gazebo, acquisition and development of parks throughout the county, and construction of the Medina County Senior Citizens Center. 4. Paul Jones was a strong, spirited, caring man -- eager to listen and share, and keenly sensitive to the needs of others. 6. New marble front and canopy added to Old Phoenix Bank and Bachtell Drug Store fronts and Electric lines were laid under the walks to melt snow in 1963. 7. In 1965 the Sharon Banking Company was purchased and an Old Phoenix National Bank was established. Theodore A. McDowell was born Feb. 1. 1908. in Medina at the home of his parents, Blake McDowell and Florence Andrews McDowell. As a small child, he spent time in Texas due to his father's poor health but returned to Medina for school. 2. He graduated from the University of Virginia in 1930 and returned to Ohio to work at the Central National Bank of Cleveland. One year later, after his father's death, he returned to Medina to work as a teller at Old Phoenix Bank. 3. Ted was a commissioned officer in the Army, which he chose to join after the bombing of Pearl Harbor, and was stationed in the Southwest as well as in Korea, serving in the military government at the end of the war. He was discharged as a captain in September 1946. 4. He returned to Old Phoenix and retired as president in 1973. He and his spouse chose to move to East Meredith. N. Y, to be near his daughter and. her family in 1980. 1. David Jones joined Old Phoenix National Bank in 1964 as a controller after being a U.S. Navy demolition frogman and working as a national bank examiner for several years. 2. When elected President of the Old Phoenix National Bank in 1976, he became the third-generation of his family to attain that position. 3. As President, Mr. Jones oversaw growth of the bank to 14 branches, $350 million in assets and an equal amount under trust department management. 4. But to Mr. Jones, the milestone of his 30-year career was the bank's drive to remake Pubic Square from what he said was its unattractive appearance of the 1950s and 1960s to its previous Victorian charm. 5. The bank board of that era was ready to move the bank off the square, but Jones was one of the "young guys" who were consulted about that proposal. Their recommendation: To keep the bank where it was and re-store it to the original architecture. 1. In 1981, First National Bank of Ohio and Old Phoenix National Bank of Medina merged into First Bancorporation of Ohio (First Ohio). 2. Among the significant events of his tenure was the 1981 union of Old Phoenix and First National Bank of Akron (now Ohio) in the formation of First Bancorporation of Ohio, a national bank holding company. 3. A big part of the decision to unite with First National was the ability of Old Phoenix to maintain its name and local control. The bank has managed to maintain its individuality. 4. The next year, First Bancorporation of Ohio purchased the Twinsburg Banking Company. 1. Following the 1995 purchase of CIVISTA Corporation in Canton, Ohio, parent of Citizens Savings. the holding company name changed from First Bancorporation of Ohio to First Merit Corporation. 1. First Merit made two deals in 2009 with St.Louis-based First Bank and its affiliate for 24 Chicago-area branches with $1.2 billion in deposits and for the affiliates' asset-based loans. 2. In 2010, the acquired First Banks are either closed or converted into First Merit branches. Expansion into Chicago continued that year with the acquisition of George Washington Savings Bank and Midwest Bank and Trust, both failed banks. 4. That increased First Merit's size from $15 billion to $24 billion in assets. 5. First Merit has 4,000 employees, and $25 billion in assets and 367 branches in Ohio, Pennsylvania, Michigan, Wisconsin and Illinois. 6. First Merit Bank has 169 branches and 224 ATM machines serving mainly Ohio and Western Pennsylvania. 7. It continues to maintain a branch on Medina Square at the site of the first Old Phoenix Bank. 1. In a monster deal between two of Ohio's largest banks, Huntington Bank of Columbus is catapulting to the national stage by buying First Merit Corp. of Akron for $3.4 billion. 2. The 2016 merger will create a bank with nearly $100 billion in assets and about 1,000 branches in eight states, with a huge concentration in Ohio and Michigan. 3. Founded in 1866 as The Huntington National Bank, today Huntington Bancshares Incorporated still operates from the same Columbus, Ohio founding location in the heart of the Midwest. As of December 31, 2017, Huntington Bancshares Incorporated is a $104 billion asset regional bank holding company. Huntington Bank representatives (from left) Steve VanDette, Medina branch business manager; Ron Paydo, Medina branch community president; Carrie Russell, Medina branch community manager; Kevin Rych, Medina branch business banker, Ron Paydo, and Dan Miksch, client advisor, presented a number of historical photos and a painting from the Old Phoenix Bank collection to the Medina Town Hall and Engine House Museum Oct. 18, 2017. 1. Proprietors dissolved their partnership in 1851 and Curtis remained the business owner at the present location. 1. Curtis sold his business to Lyman and Armstrong in 1855. 1. Joseph Whitmore combined the profession of jeweler, dentist and photographer and was postmaster during the Pierce administration, an obliging, kindly man. 1. 1875-Our Post Office is still flourishing under direction of our worthy post marm, Mrs., Hendrickson, who has her son, Blake, as a deputy consumptive, but capable, emaciated but efficient. 2. C.C. Williams Clothing Store rented front part of Post Office and moved in 1871. 1. Whiteside rented front part of the Post Office and has a general news agency with daily papers and magazines for sale. 1. James H. Greene bought the office of the Medina County Gazette in 1869 and served as publisher and editor until his death in 1890. 3. In 1880, Charles H. Kimball became assistant postmaster serving in that capacity for 6 years. 1. In 1886, Egbert Green was appointed Postmaster of Medina Village by President Grover Cleveland. 2. Charles H. Kimball was employed by the A. I. Root Company during the Democratic interregnum from 1886 to 1890. 1. Charles H. Kimball was born at Benton N. H. In 1834 and came to Medina in 1855 where his oldest brother Francis D. Kimball, who later became Attorney-General of Ohio, was engaged in the practice of law with William Canfield. 2. Charles H. Kimball enlisted in 1862 in the 103rd regiment O. V. I and served to the close of the Civil War when he returned to Medina County and located on a farm in Montville township. 3. In 1891, Charles H. Kimball became postmaster of Medina village, being chosen by popular vote of the patrons of the office and served until another Democratic era began under Postmaster Louis S. Smith in 1895. 1. Louis S. Smith was born in Elyria in 1850 and was educated in Medina village schools. “Lou” bore an active part in village affairs, leading the village band, being an officer of the volunteer fire department and its chief for a time and a member of several fraternal organizations. 2. In 1899, he moved to Cleveland where he was manager of the Diebolt Safe and Lock Company. In 1922 he returned to Medina for retirement. 3. Louis S. Smith was elected postmaster of Medina village in the second term of President Grover Cleveland. 4. Charles H. Kimball was retained by Louis S. Smith as assistant postmaster during his term to 1899. 1. Albert Munson was admitted to the bar in 1873, later taking office as probate judge in 1877 and serving to 1885. Judge Munson went into private practice following his judgeship. 2. In addition to his political and spiritual activities, Albert Munson and his son, Lyman ran a successful hardware business on Public Square. The handsome Victorian building that housed the business still bears the family name. 4. The first mail carrier service was established in 1901, when five rural routes were created. 5.. Charles H. Kimball was retained by Albert Munson as an assistant postmaster during his term to 1905 and serving in all more than 20 years in the post office. 1. Charles D. Wightman was born in Lafayette Township in 1866 and grew up on a large 200 acre farm. He graduated from Medina High School in the class of 1886 and graduated from Adrian College in 1889. 2. Charles D. Wightman practiced law in the office of Judge George C. Hayden and was admitted to the bar in 1893. 4. In 1893, Mr. Wightman was elected prosecuting attorney of the county and in 1896 was re-elected. In 1897, he was elected to the state senate from the joint 27th-29th district, consisting then as now, of Richland, Ashland, Lorain and Medina counties, and re-elected in 1899. 5. His record, both in the committee room and on the floor, gave him a gratifying reputation and he was often mentioned for higher legislative honors but never became a candidate for them. He served on several important commit-tees, being chairman of the judiciary committee. 6. In 1905, Charles Wightman was appointed postmaster of Medina, and served for six years, giving a most efficient and satisfactory administration, doing much to improve and systematize the office. 7. Two city routes were started in 1907, since the population of Medina had then increased to 2,500 people. 8. The 1st telegraph office was installed in Old Phoenix block on west side next to William Asire Furniture Store. 1. Dr. Hugh S. Orr long engaged in the practice of the veterinarian’s profession with Medina village as his headquarters, serving the entire Medina County. 2. Hugh S. Orr was Medina County sheriff, who served from 1902 to 1907, was the incumbent of the office in stirring times. 3. In 1911, Dr. Orr was appointed postmaster of the Medina village for one term. 4. In 1916, the Village needs a new Post Office, has outgrown the Phoenix Block location. McDowells own it and offer to add addition if they will stay. Post Office left 1916. 5. W. E. Griesinger wants the Post Office in his lot on South Court north of the Methodist Church and will grade it for a building. 6. In 1916, the Medina Village Post Office moved to the Old Courthouse building at #2 West-side Public Square. 1. Tuttle moved from the H. J. Walker Block on South Court Street in 1916.